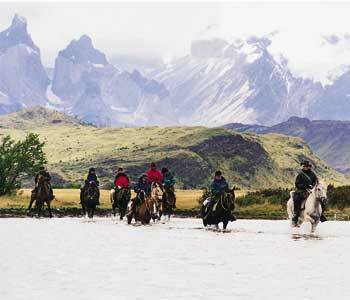 Here is a chance to visit on horseback the extreme southern tip of Patagonia near the Straits of Magellan. The ride traverses the amazing Torres del Paine National Park, known as one of the wildest and most rugged places in the world. The bizarre landscape holds spiny mountains as impressive as the Tetons or the Alps, with huge glaciers dropping great chunks of ice from time to time into azure lakes. The birds and animals such as penguins and guanacos are unique. For more information see Equitours Worldwide Riding Tours..